In order to fully assess your keratoconus, understand the likely future course of the disease, and make appropriate treatment recommendations, an extensive eye examination is performed along with several specialized tests to fully analyze your problem. These tests also give you a complete baseline for your ongoing care in the future. For your initial keratoconus examination with Dr. Hersh, you should plan to be here for approximately 3 hours. Your eyes will be dilated, so a driver is recommended. There are a nmber of goals of this comprehensive keratoconus evaluation. First, we want to fully assess and define your keratoconus in order to monitor progression over time. Second, this testing will allow us to best recommend a course of treatment to optimize your visual function. 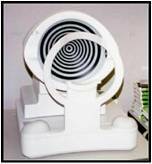 Corneal topography instruments assess your cornea's optical surface. These are corneal maps that can assess many indices of your individual corneal shape and structure. We use a number of instruments, each of which may give different clues to the corneal shape, including the Pentacam, Topolyzer, and EyeSys units. Corneal topography is analagous to looking at a mountain range from a satellite. A normal cornea is green (like a gentle slope). Red is a higher point (like a mountain), and can indicate keratoconus. Blue is a lower point (like a lake). In some cases of keratoconus, your corneal topography map can be used to help program a laser for topography-guided PRK treaments. Ocular Coherence Tomography is analagous to an MRI of your cornea. It gives cross-sectional, magnified pictures of your cornea from which we can study all of the corneal layers. 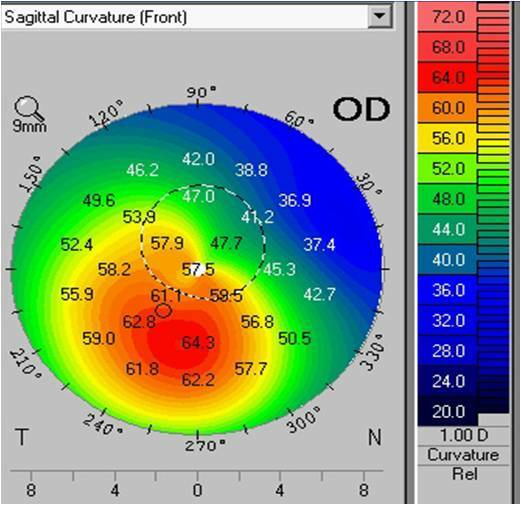 OCT allows us to map your corneal thickness in detail. Wavefront analysis assesses the eye's optical system and aberration profile. Because of the optical irregularities of the keratoconic cornea, light is not completely focused. This causes scattering of light rays and the formation of "visual static", much like the static that you may find on a TV. Wavefront analysis defines the particular types of static that are present in the keratoconic cornea. It is analogous to using a computer to check for any static on your TV. The Optical Response Analyser (ORA): is a new instrument which measures the elasticity and flexibility of the cornea and is the first true clinical measurement of corneal biomechanics in KC. This may allow for better diagnosis of early keratoconus, help to predict its possible progression, and allow for monitoring of changes in the keratoconic cornea. Corneal thickness (ultrasonic and optical pachymetry) measurements detect the degree to which a keratoconus cornea is thinned. In KC, the cornea is thinner and weaker than normal. Changes over time can be monitored by periodic assessment of the corneal thickness measure both by ultrasound and by optical imaging on the Pentacam unit. Refraction (determination of prescription). This is more difficult in the keratoconic patient, since the corneal optics are distorted. Various techniques allow us to best measure your refraction and optimize, as best possible, your glasses corrected vision with keratoconus. Pupil size by infrared pupillometry may help to assess daily fluctuations in vision in the keratoconic patient. Binocularity testing determines how you are using your two eyes together. In addition to these specialized tests for KC, Dr. Hersh and the staff at the CLEI Center for Keratoconus will perform a full examination looking at all aspects of your eye health during your KC evaluation.